Ekphrastic poetry has been an interest of mine since Bennington, when Thomas Sayers Ellis turned me on to it. In 2001, my colleague Emily and I co-taught a daylong workshop on ekphrastic poetry, a collaboration between Inkberry and a local artists' center. This winter I've been immersed again in ekphrastic poetry -- again thanks to Emily and Inkberry. Emily orchestrated a partnership between Inkberry and the Williams College Museum of Art on an exhibit called The Moon is Broken. Ten regional poets are involved; each was invited to curate an "image-poem" out of WCMA's collection of black-and-white photographs, and to create a written poem in response to, or arising out of, those images. The poets involved are Trudy Ames, April Bernard, Cassandra Cleghorn, D. L. Crockett-Smith, Peter Filkins, Larry Raab, Mary Ruefle, Barbara Tran, John Yau -- and me. The commissioned poems were due on January 7th. I chose my images back in the fall, and spent a long time staring at them, arranging them on my desk, thinking about what sort of poem might arise out of them. As the season progressed I wrote a few desultory drafts, but nothing that made me happy. I decided to backburner the project until the gap at the end of the calendar year. I imagined sequestering myself at my desk with a pot of good hot tea, watching snow fall, and working on the poem all week long. Of course, the end of the year didn't exactly go as planned. Fortunately, my hospital experiences also gave me a world of new experience, jumbled thoughts, and vivid sense-impressions to draw on. 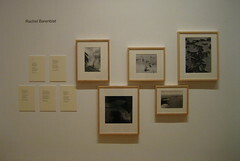 Suddenly all five of my photographs seemed related by the thread of my experience with illness. Even though I'd chosen images which were almost entirely non-representational -- only one features a person, and the person's halfway out of the frame -- the photographs seemed to speak to my hospital stay, and my fragility, in surprising ways. I went to see the show yesterday. Peter Filkins' piece -- a series of short poems, in which the last line of each is the first line of the next, linking the verses like a crown of sonnets -- made me inhale hard with surprise. April Bernard's poem is gorgeous. Mary Ruefle's poems, and her creative erasures, are too. Honestly, the whole exhibit is excellent, and I'm honored to be a part of it. 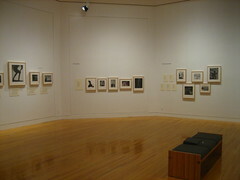 The exhibit is free and open to the public, and will be on display through July 8. On April 22, a poetry and jazz ensemble called Merge will respond to the images and words in the exhibition with a (free) performance. And on April 29th, Inkberry and WCMA will co-present a reading (also free) by several of the contributing poet-curators; we will read our works in the gallery, surrounded by the photographs we chose. Technorati tags: ekphrasis, RachelBarenblat, inkberry, poetry.